Turmeric is an important spice crop cultivated in western zone of Tamil Nadu. Climatic conditions in Erode district are conducive to turmeric cultivation. Though the crop has potential market value and is suitable for value addition, the farmers are facing acute labour shortage during the intercultural operations such as weeding and especially at the time of harvesting. Around 30 – 40 pairs of men and women labourers are required to harvest an acre of turmeric field. This is the root cause which made Mr. Ramaraju think of an alternative which could circumvent the labour problem. He worked round the year to design an efficient turmeric harvest. His earnest efforts finally yielded an excellent improved version of power tiller operated turmeric harvester. It is a power tiller drawn equipment requiring 13 HP power. It consists of a shaft connected to small diggers, arm and shaker. While operating this machinery, the diggers pull up the turmeric clumps and soils are loosened from the clumps with the help of shaker. The field capacity of this harvester was tested in different soil conditions and found that 7 hours are required to harvest one acre of turmeric. However, some preconditions are required: the space between the rows must be 1.5 – 2 feet, lengthy ridges and furrows and most opted to the fields with drip irrigation system. Since majority of the area turmeric is cultivated under raised bed system, MYRADA KVK thought some refinement is needed in order to suit this machinery in different types of soil and method of cultivation. Based on the farmers’ feedback, Kendra modified / refined the harvester with the support of innovative farmer Mr. Ramaraju. This intervention has proved the efficiency of the harvester to the farmers through demonstrations and as documented by Myrada KVK . It is highly labour saving; it requires only one male labourer and 15 – 20 women labourers to harvest and collect the rhizomes from an acre area where as manual harvesting requires 40 pairs of labourers, which costs around Rs.9,000 – 12,000/-. 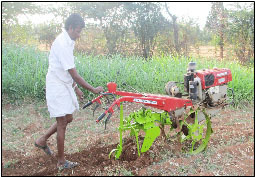 Hence, by using this harvester one can save upto Rs.5,000 – 7,000/- per acre. It covers an acre area in 7 hours and consumes 1.00 litre diesel per hour which a small farmer can afford to spend. A special attachment to the harvester shakes the harvested rhizomes so that the soil adhered to them drops to the field, leaving the rhizomes clear for collection. By using this harvester, the farmers can avoid the delay in harvesting caused by labour shortage. The harvester could also be rented out to neighbouring farmers to earn additional income. With the support of MYRAD KVK Erode, he demonstrated the performance of the turmeric harvester in Tamil Nadu, Karnataka and Andra Pradesh. Apart from this he sold 150 pieces of turmeric harvester to various districts of Tamil Nadu. The cost of turmeric harvester is Rs.30,000/-. His innovation was recognized by Indian Council of Agricultural Research, New Delhi and he was honoured as the best farmer innovator in 2010 during the National farm innovators meet held at JSS.